The guy can flat out hit. There’s no denying it. 20 MLB seasons, 569 home runs, 1,835 RBI, 3,020 hits and a .288 batting average all says Hall of Fame. Unfortunately the fingerpoint and vehemently denying his use of performance enhancers has forever tarnished his legacy. Whether he knowingly or unknowingly took steroids or it was that allegedly tainted B-12 injection from teammate Miguel Tejada, anything he ever did in the game is regarded as irrelevant. Once Palmeiro returned from the 10-game suspension, the Orioles told him to stay home. That was that. His career was over and there was nothing he could do. Fast forward 13 years, and the former first-rounder is 53 years old and playing Independent League baseball for the Cleburne Railroaders of the American Association. Also on the squad is his 28 year old son Patrick, who is in his sixth pro season and fourth in Indy ball. 26 games and 100 at-bats later Palmeiro is hitting .293 with five home runs, 15 RBI and a .926 OPS. This isn’t his first foray into post MLB lifestyle. In 2015, the elder Palmeiro took the field with Patrick to make history. 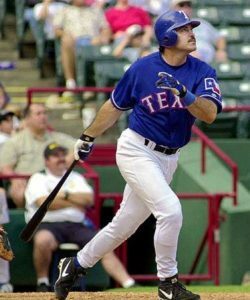 He appeared in one game for the Sugar Land Skeeters going 2-4 driving in one. After being relatively quiet for the past 13 years, Palmeiro wants to rewrite the ending to a storied career that took such a disastrous turn. Will he ever find forgiveness? Will he ever be accepted again by his peers? We may never know. But one thing’s for certain, on the ball field, the guy is automatic.